Two things made me take up my (electronic) pen today. First, on BBC TV yesterday the wonderful Martha Lane Fox gave the annual Richard Dimbleby lecture. She will challenge us all – leaders, legislators, and users – to understand the internet more deeply and to be curious and critical in our digital lives in order to tackle the most complex issues facing our society. It reminded me that not long after I started the HelpGov blog I responded to a consultation she organised as the government’s then digital champion on the future of the old (and appalling) UK government web sites. Her efforts led to the formation of the GOV.UK team and something of a transformation in the UK government’s web presence. 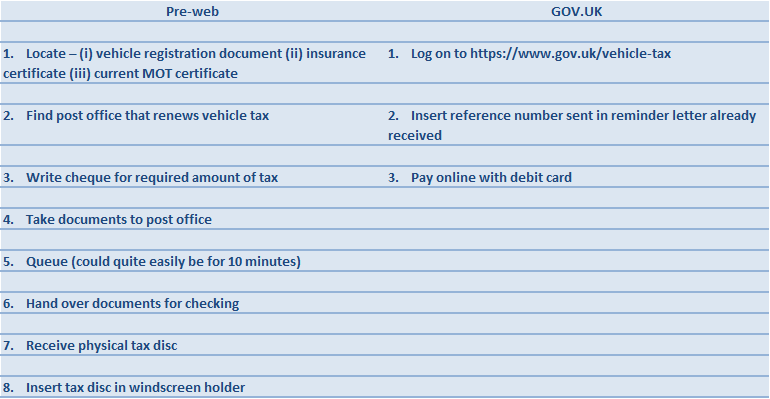 Second, and much more prosaically, I’ve just renewed my vehicle tax online. As a once-upon-a-time advocate of process maps I thought I’d compare the pre-web and GOV.UK processes of this onerous task. As you’ll see they’re not strictly process maps, but you’ll get the point. There are/were other ways to fulfil the same task but this is the way I used to do it and did it today. As I said, it’s prosaic, isn’t it? It’s even more prosaic than my steps suggest because the web site is just about one of the easiest I’ve used, with my payment accepted with less information than most commercial sites and an e-mail already received confirming all the details and that I’m now taxed for another twelve months. The impressive thing is that the change not only focusses on my needs as a taxpayer but also must save major costs in staff time and printing. And it’s not only the transaction that’s been made easier. If I want to check any question about taxing my car, or indeed any other aspect of government from policies to the availability of data it’s easy to find on GOV.UK. I’m almost ashamed at both my cynicism when I wrote to Baroness Lane Fox in 2010 and my misunderstanding of what she was about. Only one thing wrong. The amount of tax I’m paying is outrageous. But I can’t blame Martha or the GOV.UK team for that. If you work in the public sector, how does your organisation’s web site match up to the GOV.UK standards?